Several must-pass sunset bills didn’t make it to the governor’s desk. We’ve compiled an overview of what it could mean for the state if these agencies are not reauthorized. Texas’ 85th legislative session may have come to a close, but things are about to heat back up. During the regular session, must-pass “sunset” legislation didn’t make it to the governor’s desk, jeopardizing several government agencies, including the Texas Medical Board. On Tuesday, Gov. Greg Abbott announced he would call lawmakers back for a special session in mid-July. The first item on the agenda? The sunset legislation. After this measure passes both chambers, the governor said he would add another 19 items to the call, including a “bathroom bill” and public school finance reform. We’ve compiled an overview of what it could mean for the state if sunset legislation doesn’t pass and the affected agencies aren’t reauthorized. What are sunset bills, and why didn’t they pass? The Texas Sunset Advisory Commission reviews the operation and efficiency of more than 150 state agencies. Most agencies undergo sunset review every 12 years. Those state agencies must survive periodic reviews by the Legislature or be forced to shut down. Five members of the House, five senators and two public members make up the panel. Members conduct comprehensive evaluations of agencies such as the Texas Department of Transportation, the Railroad Commission, the Texas Public Utility Commission, the Department of Insurance and others. Twenty-five agencies were scheduled for sunset reviews during the 2016-17 biennium. After seeking public input, the commission adopted recommendations on how to improve each agency’s operations and to recommend whether each should continue to exist. Several attempts to pass “safety net” legislation extending the lives of those five agencies for another two years fell short, forcing the governor to call a special session to keep them alive. How does this play into the tension between the House and Senate? 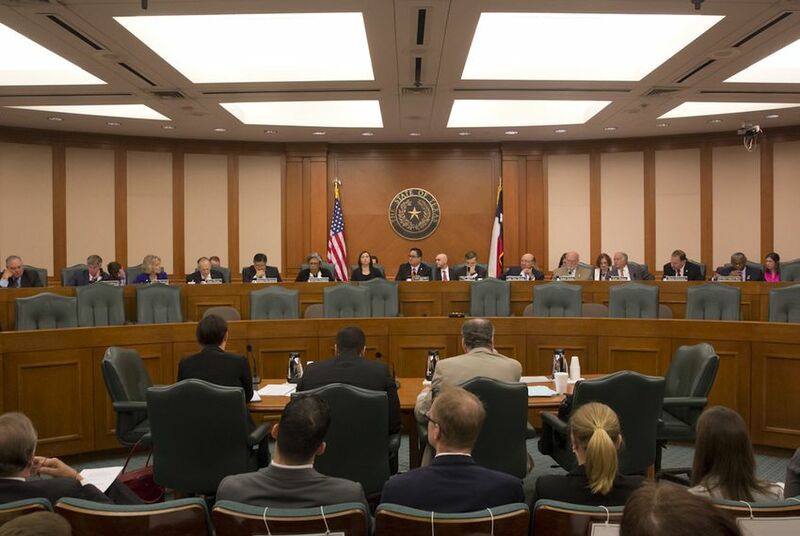 In late May, House members of the Sunset Advisory Commission accused the Senate of playing games with Texans’ health and safety by holding back legislation that would keep the Texas Medical Board in existence. Shortly after that, in their own news conference, members of the Senate said that the House had created problems that can only be fixed in a special session of the Legislature. The sunset standoff is the latest skirmish between the two chambers. While sunset bills are critical to keeping state agencies open, Lt. Gov. Dan Patrick threatened to hold legislation hostage to force a special session if the Legislature would not act on a “bathroom bill” to regulate bathroom use for transgender Texans and property tax legislation to require voter approval when local tax collections increase 5 percent. State Sen. Van Taylor, R-Plano, later said that the House “created the crisis you see in front of you today,” and argued that while the House’s proposed fix on the pending sunset legislation would continue five agencies at risk of closing, it would not extend chapters of state code. Why is it so important the Legislature passes this measure? The sunset safety net bill that didn’t pass would have kept a handful of state agencies alive until after the next legislative session. One agency Texans may be looking out for is the Texas Medical Board, without which the state has no way to license doctors. Without action by the Legislature, the agencies without regulations would enter a one-year “wind-down” period after Sept. 1, 2017, in which they would begin the process of shutting down completely. Will there be no doctors in Texas if the Legislature doesn’t work this out? Joey Longley, the former director of the Texas Sunset Commission, said that even if the Legislature fails to pass sunset legislation, there will still be doctors in the state of Texas. They just won’t have licenses. “Anybody, anywhere could call themselves a doctor, and who is going to challenge that? There’d be no statute that says you have to do anything to be a doctor," Longley told The Texas Tribune. “There are no secret passages out of this,” he added. Unlike previous legislative years, the safety net bill was not placed on the Major State Calendar, which would have fast-tracked it through the legislative process. This year, the bill was placed on the Daily House Calendar with several other measures, which made it harder for the bill to pass through the lower chamber. But this isn’t the first time the lawmakers failed to pass a sunset bill. The predicament the Legislature is in now is reminiscent of 2009, when both chambers failed to pass another “sunset safety bill” to keep state agencies like the Texas Department of Transportation and the Racing Commission from shutting down. A special session followed. How can I follow along with what happens during the special session? The Texas Tribune will be following the special session closely. Sign up for The Brief for a daily rundown of special session news in your inbox.